meets the rigorous European Union standards for noise immunity. The SCL drive is ideal for 3-phase motor control applications that require reversing, soft start, and/or variable speed up to 4 times the motor rated RPM. Combined with integral thermal overload protection, this virtually eliminates the need for 2-speed motors, motor starters and reversing starters. The SCL drive can also be used as a phase converter to operate a 3-phase motor from a single-phase supply. 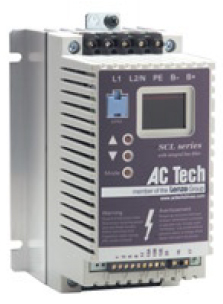 SCL series drive is configured and ready to use for most simple applications. By simple reprogramming, the SCL can perform many application specific tasks such as multiple preset speeds, motor jogging and electronic braking by adding the optional dynamic braking kit. Additional options include a full function NEMA 4X remote keypad, DIN rail mounting kit and 'through hole mounting' which puts the heat sink outside the electrical enclosure. The optional electronic programmable module (EPM) programmer can copy drive programs in 2 seconds. The EPM becomes the drive's memory and plugs easily into the SCL drive. Switching pre-programmed EPMs saves time and avoids errors allowing your machine to operate in different modes or process different products without reprogramming the drive.